There have been numerous enquiries to a516digital from viewers abroad who have lost access to BBC, ITV and Channel 4 services in recent days, having survived February's satellite switch, which reduced the availability of UK channels abroad. In March, some pay TV channels on the Sky platform, including Dave HD, moved to the UK spotbeam, reducing channel choice in Europe further. Due to the very tight footprint of the new UK spotbeam on the new Astra 2E satellite, where reception drops off rapidly over just a relatively short distance, the slightest variation will impact on reception. This will affect the main UK free-to-air channels; most other services use the pan-Europe beam which is easily receivable across most of western and central Europe. Viewers who live outside of the intended coverage area (shown in this map) cannot be guaranteed a reliable service. 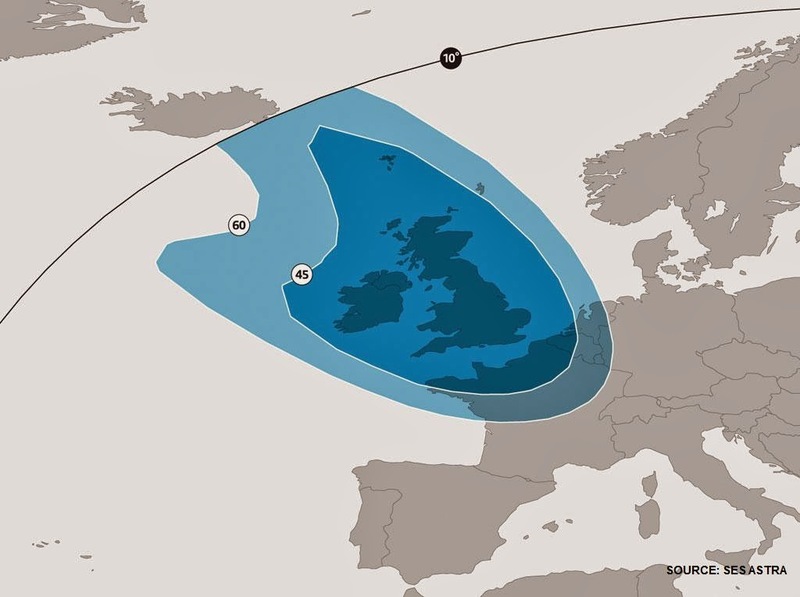 The map shows the area in which a Sky or Freesat mini-dish can be used for reception of UK TV services that use the UK spotbeam. In reality, reliable reception with a large domestic dish up to 80cm-100cm in diameter is possible as far east as Bremen in Germany, and almost as far south as Toulouse in France. Beyond these points reception drops off extremely rapidly for the next 100km or so, before entering a null point where reception is impossible or extremely difficult. The exact edge of the spotbeam may vary slightly from day-to-day and month-to-month and be influenced by a number of external factors (more below). At the moment, some viewers around the edge who had good reception have started to see disruption to their service for the first time since the satellite switch took place. Some viewers who found themselves outside of the main spotbeam have ironically been able to get reception of UK channels for the first time - usually during the hours when viewers who could get reception lose theirs. As the edge of the main spotbeam moves slightly, the sidelobes (more on sidelobes here) move slightly, so viewers previously in the dark find themselves benefiting from scraps of the signal reaching them on a sidelobe. There's very little that can be done about these changes. There are a number of causes for variable satellite reception at the edge of the spotbeam, some of which would be inconsequential in normal circumstances. Reasons include thermal distortion up at the satellite, solar wind patterns, sunspots, the position of the sun in relation to the satellite, conditions in the ionosphere, local weather conditions and the slightest misalignment of satellite dishes, e.g. following strong winds. It's striking that most complaints are because of loss of reception in the evening. Usually Astra 2E is directly facing Europe and the sun (and the solar wind) during the late evening (GMT). During March and until 11th April 2014, the sun disappears behind the earth from Astra 2E's perspective, meaning the satellite needs to switch from solar feed to battery back up. These daily "eclipses of the sun" for the satellite have varying lengths. At the moment, they are at their longest. On Sunday 23rd March, the eclipse will last from 21:32 GMT to 22:40 GMT. From reports, reception problems seem to be their worst around these times. The satellites serving the UK are operating normally, however. Information from operator SES confirms that Astra 2E is orbiting at 28.35 degrees East, slightly further over from sister satellite Astra 2F, which is closer to 28.2 degrees East. Astra 2E's position varies slightly, which is normal for such satellites, which operate within an agreed "box" as they keep up with the earth's orbit. During the next two weeks it will be around 28.32 degrees in the early morning and 28.37 degrees East during the late afternoon. The minor differences in orbital position do not reflect the times when some viewers are reporting loss of channels. Following technical work over the weekend, which meant that the comments feature was disabled for around 12-15 hours, I'm pleased to open this article for comments. Please note the terms & conditions before posting.